The upcoming all-new Lexus GS has been spied undergoing testing in US. As expected, it will be a production version of the LF-Gh concept shown earlier this year at the New York Motor Show. Toyota has been very secretive of what the new GS has in store and there is very little we can tell from the heavily camouflaged mule. There are a few details of what&apos;s under the hood that we are aware of. We do know that the current LS 450h has a 3.5-liter V6 engine giving an output of around 296hp with a top speed of 149 mph and can accelerate from 0-62mph in 5.9 seconds. Toyota engineers have been working hard to reduce the CO2 emissions and provide a more eco-friendly sedan. 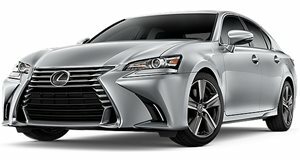 The Lexus GS 450h hybrid has been selling at a price tag of £44,615 or USD $71,259 equivalent in the UK. If nothing else, we really hope that Lexus plans to incorporate the styling from the LF-Gh concept. Perhaps this will give the brand the dose of adrenaline it desperately needs. Photos courtesy of gmotors.co.uk.